HSS at the Festival of Biodiversity! 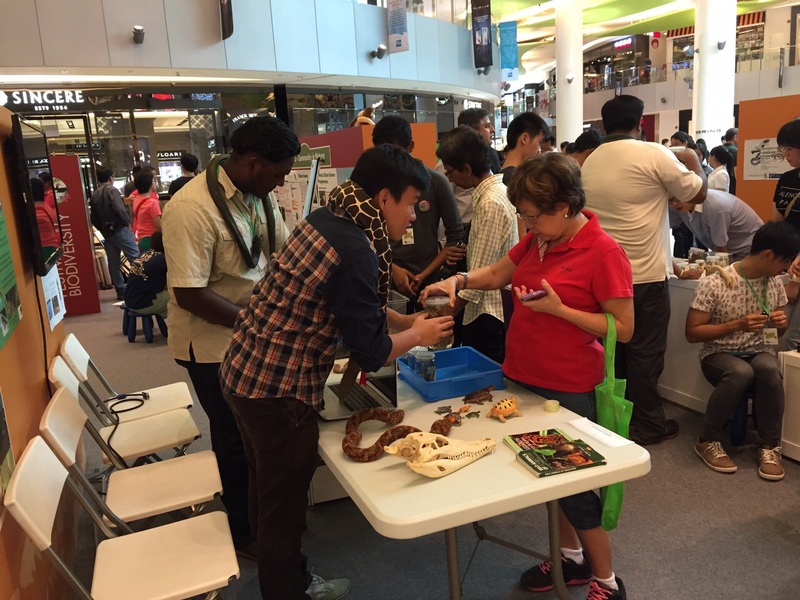 We are currently doing a booth at Vivocity Central Court for the Festival of Biodiversity. We will be here from 10AM-10PM on 27th and 28th June! We had a few technical issues, but we finally got the TV working! 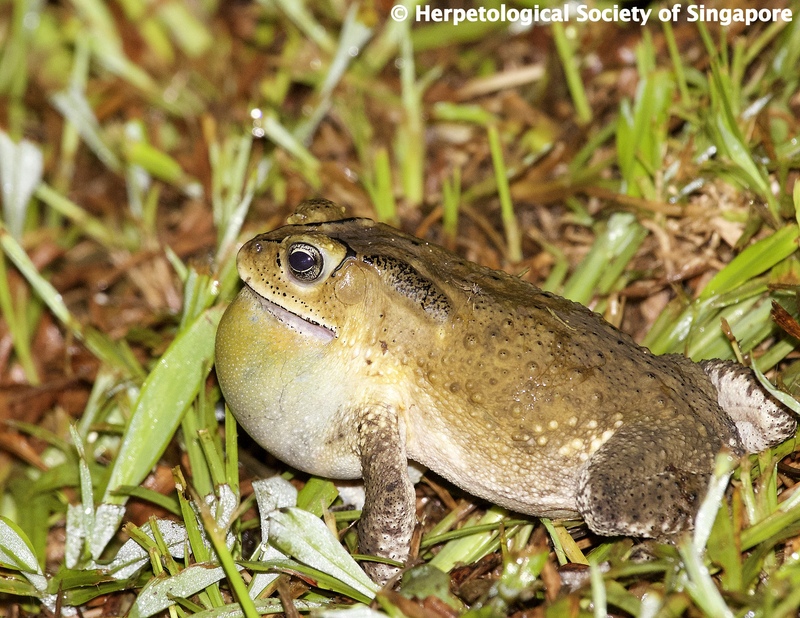 We have a slideshow running with some of Singapore’s interesting herps! 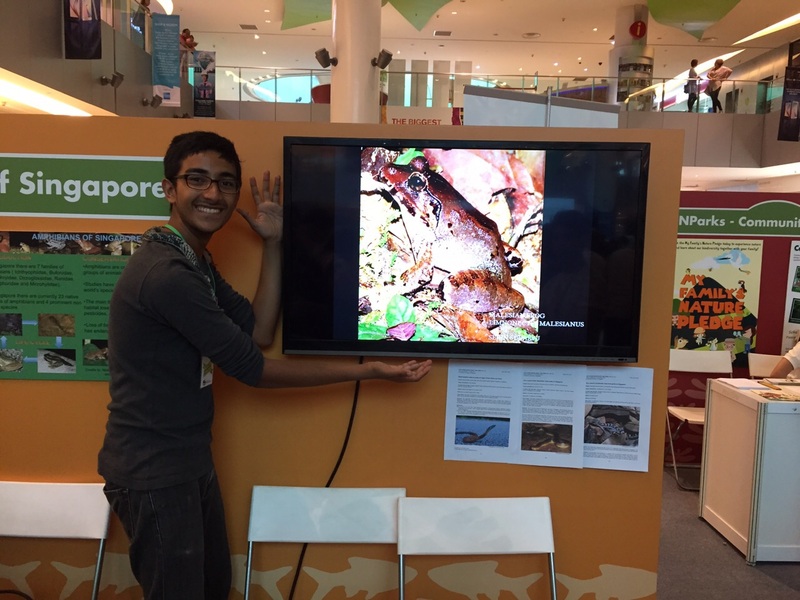 We also have some awesome posters, telling people about Singapore’s herp diversity. Some of our members are doing active outreach! 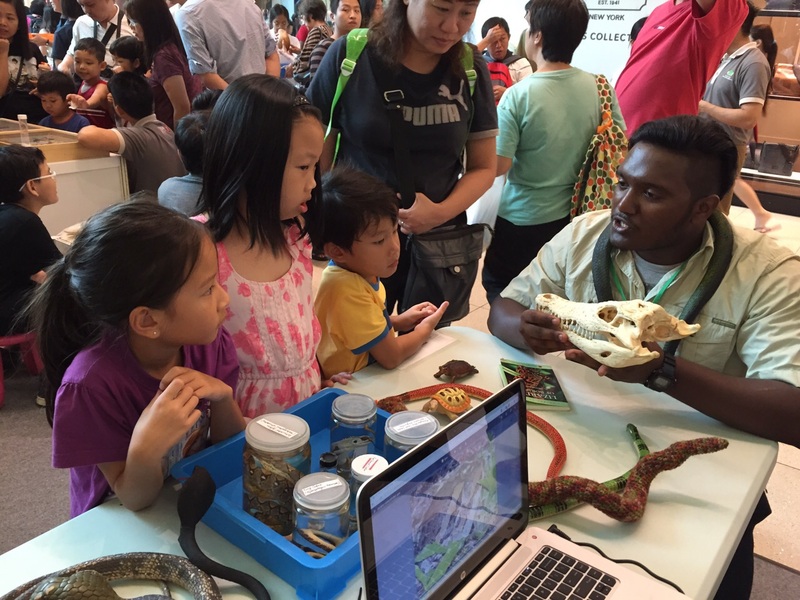 The public, especially the kids, is very interested to learn about these amazing creatures. And we are very happy to share! This is the first public debut of the HSS and we’re genuinely very excited for this event! Here, Serin is talking to some very interested kids about the Estuarine Crocodile and its powerful jaws! 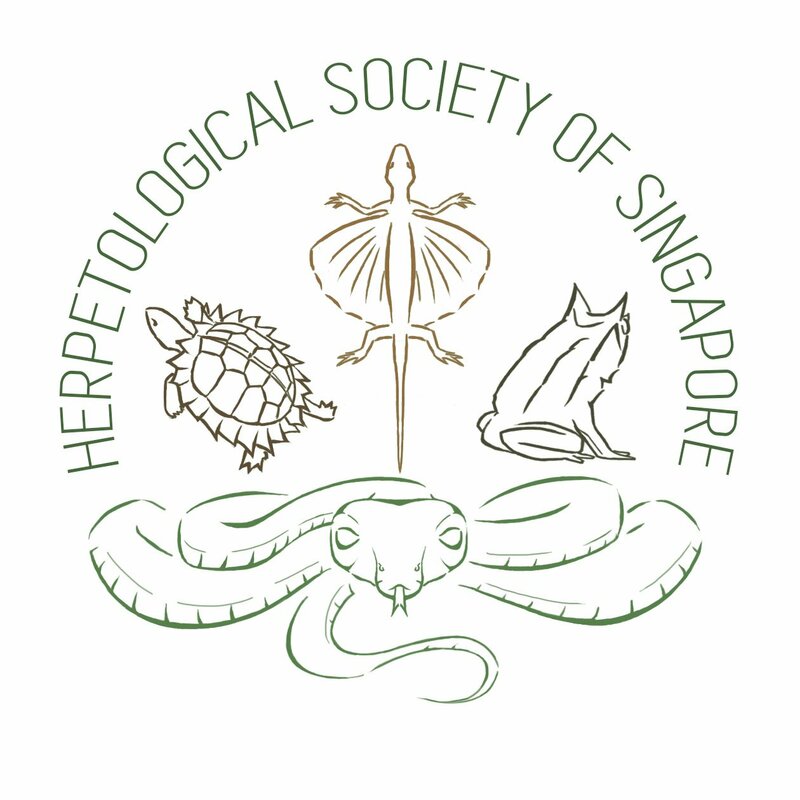 The HSS would like to whole-heartedly thank the Lee Kong Chian Natural History Museum for lending us some herp specimens to aid our outreach! We would also like to thank NParks for facilitating the entire event and being so helpful every step of the way. So, come down to Vivocity and check out what the HSS, as well as many other Singaporean Green Groups have in store! An adventure on the legendary island of Pulau Ubin! During the day, Ubin plays host to a variety of very interesting animals (not necessarily limited to herptiles). Ubin Day was held on 13th and 14th June 2015. Some of the HSS members went down to the island to volunteer for the day’s activities. Having had a very busy day helping out with the day’s festivities, we were very grateful to spend the evening at the beach with a BBQ dinner. The dinner had been kindly hosted and sponsored by the Ubin fish farmers. We sat at Jelutong Campsite, watching the sun set, while resting our tired legs. But we were far from done! We set off on a night adventure, our bellies full of lamb and seafood! 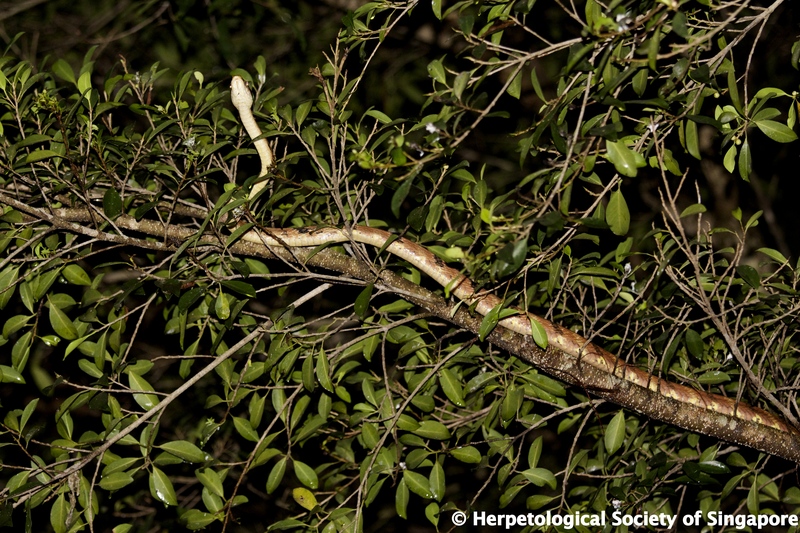 On a previous Ubin stay-over, we found a Dog-toothed Cat Snake (Boiga cynodon) actively foraging on a tree, as well as many other interesting herps. So we were excited to discover what awaited us! We followed a guided walk conducted by the Vertebrate Study Group from Nature Society (Singapore). Our lead guide was Timothy, who brought us to Puaka Hill, the tallest point of Pulau Ubin, at 74m high. Along the way, we kept our eyes peeled for herps. We had the privilege of seeing an Oriental Whip Snake (Ahaetulla prasina), which was sadly the only snake seen during the walk. We had better luck with amphibians, probably due to the heavy rain the previous day. The night air was heavily saturated with the sound of amorous anurans. We came across a pair of mating Dark-Sided Chorus Frogs (Microhyla heymonsi). Along the way, we also saw a single Asian Toad (Duttaphrynus melanosticus). Thus we ended the night, As we returned to our campsite, the calls of fornicating frogs engulfed us and continued well into the night. The next day, we began the morning with Pedal Ubin organised by the NUS Toddycats. It was a great experience despite the rain. While passing a section of mangroves , we noticed this little creature; a Black Marsh Terrapin (Siebenrockiella crassicollis) drinking from a puddle of fresh water formed by the rain. We took this opportunity to tell the participants of Pedal Ubin about the chelonians of Singapore! All in all, we may not have seen a lot of herps, but we definitely had a lot of fun. Ubin is one of the last few strongholds of biodiversity in Singapore. It is certainly something that we must value. You can read more about the Ubin Project here. P.S. Team HSS will have our very own booth in the Festival of Biodiversity. The FoB will be held at Vivocity on the 27th and 28th of June. We will have specimens, models and posters on display. So, do drop by and say hello! We’re very excited about this!